I always know when Blue jays are around because they make quite the entry with their loud raucous calling. They usually come in a group of four or five as they make their way through the trees to my feeders. I make sure to have a premium seed mix with peanuts and fruit in it as they love that. I also line shelled peanuts (unsalted) along my deck railing just to watch them fly in to collect them. Very entertaining! Also entertaining is observing a Blue jay take one of those peanuts and then fly down to the grass. It will then place it within the blades of grass and then cover it up with a leaf that it finds nearby. I really do not know if the Blue jay finds it again but I am thinking probably not especially if the leaf blows away. :-). Blue jays are interesting birds to observe for sure. Read on for some interesting facts about them…..
Did you know that Blue jays can mimic the calls of a hawk? My husband and I just last weekend thought there was a Red-tailed Hawk nearby making its high pitched call but after inspecting all of the trees around discovered that it was a juvenile Blue jay crying out. Blue jays also make calls that sound like Red-shouldered Hawks usually as a warning call to tell other jays that one is nearby. 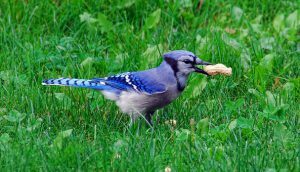 Blue jays tend to be noisier outside of the breeding season. This is because they are more secretive and tend to be quieter when nesting. Of course if there is a predator coming around they can be heard loud and clear as they try to fend them off. Blue jays aren’t really blue. In fact there is no real blue bird because they have no blue pigment in their feathers. It is actually melanin which is brown. The blue coloring is a result of the unique inner structure of the feathers that distorts the reflection of light off of the bird. They are monogamous for life or at least until one of them dies. Some Blue jays migrate sometimes and some do not. The ones in the northeast usually are year round residents but others may migrate one year and then stay put the next. The theory behind that is because food supplies may not be as high one year so they migrate to better feeding areas. 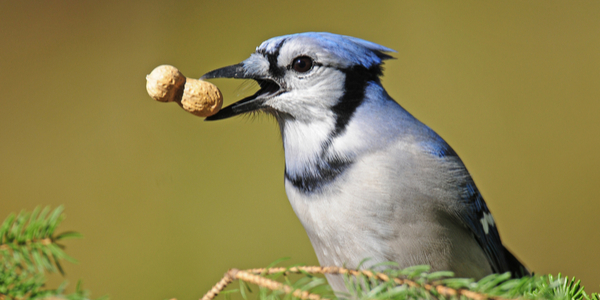 Blue jays have been known to eat other bird eggs or nestlings. However there are no proven studies. Have you ever heard of anting? Blue jays, crows, and magpies do this by taking an ant and then rubbing it all throughout their feathers. Researches claim that they do this to rid the ant of its formic acid which apparently does not taste too good for the birds. Once the birds rub the ants on their feathers they then eat them. There are ten other jay species in North America. The Gray Jay found more north near Canada, Steller’s Jay along the western side of North America (we have seen them in Colorado), the Green Jay and Mexican Jays can be found in the more southern parts of North America such as Texas and Arizona. The Brown Jay (lower Texas and Central America), the Florida Scrub-Jay found mostly in Florida, the Western Scrub-Jay found out west, the Pinyon Jay found in the central United States, and the Island Jay can be found on Santa Cruz Island, California. 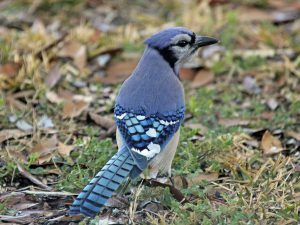 Blue jays can be found in the eastern and central parts of the United States in residential areas, woodland edges, in parks, and at backyard feeders. Their diet consists of acorns, nuts, seeds, berries, and also caterpillars, grasshoppers, and beetles. 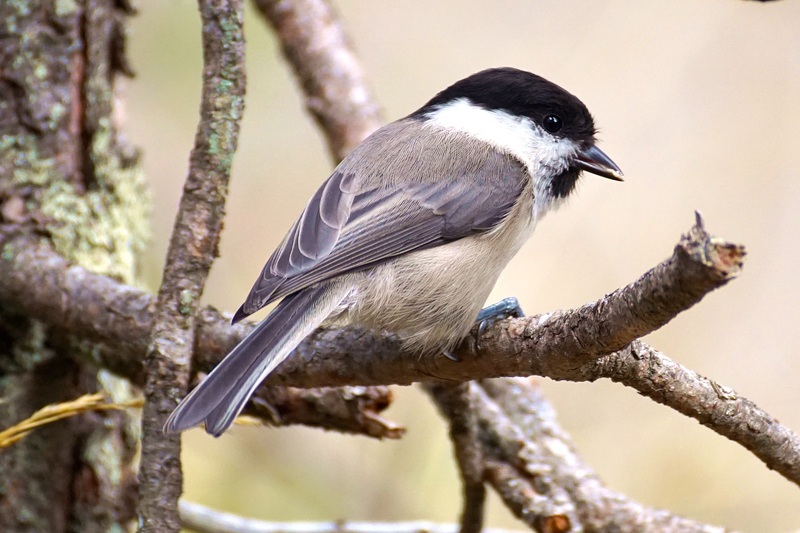 It is easy to attract this bird if you have bird feeders that include peanuts, sunflower, and fruits in it. 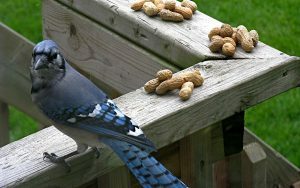 Blue jays will also gladly come in to suet feeders. Just for fun you can also place shelled peanuts (unsalted) or just peanuts out and watch them carefully fly in to collect them. Don’t be surprised if one bird comes in and collects them all (one by one of course). Blue jays are one of my favorite backyard birds because of their interesting behaviors. I love to hear them enter my back yard with their loud squawking noises or their “jay, jay” calls as they come in to feed. It is always a delight to watch them move about the trees and to the feeders. Of course their beautiful blue coloring is always a sight to see. It is hard to believe that they are not really blue too. The unique inner structure of their feathers distorting the reflection of light off of the bird makes them appear blue. Who knew?!! The next time you see a Blue jay present make sure to observe it to see what it is doing. You may hear it calling like a Red-tailed or Red-shouldered Hawk or you may see it anting where it rubs an ant all through its feathers before eating it. You just never know what it will do next. That is what is so neat about this bird! Do you have any comments about the Blue jay? I would love to hear from you. Please feel free to make your comments below. Posted in Backyard Birds, Bird Feeders, Songbirds and tagged blue jays. ← What Is A Green Heron?